When closed, the chimney damper seals in your heat and air conditioning, seals out birds, animals and insects. The Top Flue Chimney Damper is a low-profile top mounted damper that also serves as a chimney cap. It has the tightest seal of any damper in the industry. Heat loss up the fireplace chimney accounts for an average 8% of your home heating costs! Energy Top Chimney Dampers help prevent this heat loss so you can stay warmer AND save money. The Top Flue Chimney Damper is attached to the top of the chimney’s flue tile liner. In the closed position, it is virtually invisible from the ground. It provides a tight fit that seals in your heat and seals out weather, insects, birds and animals. The Top Flue Chimney Damper and Seal Tight Dampers are very easy for home owners to operate. A chain drops down the fireplace; a bracket is attached to the fireplace wall, keeping the handle easily accessible. A slight pull on the chain releases the spring-loaded top into the open position. 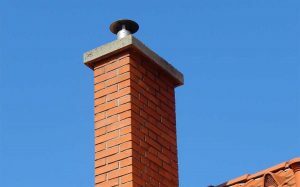 When open, this chimney damper design is least obstructive to exiting smoke. The ENERGY TOP Chimney Damper is constructed of stainless steel and aluminum, meaning it will not rust or corrode. Mounting adhesive and hardware are included, making it easy to install. Chimney caps come in a variety of shapes, sizes and materials. They are typically made of galvanized metal, stainless steel and copper. Best Cincinnati Chimney carries sizes to fit single or multi flues. We also have available custom chimney cap sizes for challenging installations. Chimney caps not only offer protection from weather and wildlife but add a nice architectural element to your home as well. 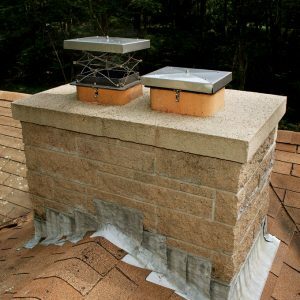 Without a chimney cap, animals and birds can make a home in your chimney, and major problems can develop. Too often, animals die in the chimney, resulting in awful odors, maggot infestation, and worse. If animals become stuck in your chimney, it can be costly to have a professional remove them. Additionally, nesting materials can cause blockages and are a source of combustible materials that can cause a chimney fire.